The reason for turning attention to non-standard susy scenarios is the fine-tuning problem of electroweak symmetry breaking. Yes, the very fine-tuning that used to be the main motivation for supersymmetry now has a supersymmetric avatar that plagues all simple susy models. By the way, David is an author of the most adequate definition of fine-tuning. It goes like this: a model is fine-tuned if a plot of the allowed parameter space makes you wanna puke. 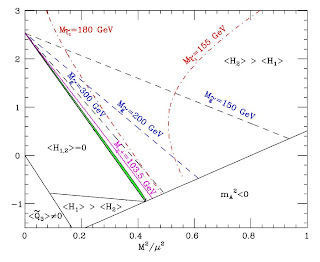 It shows the allowed parameter space in mSUGRA - the most popular of the MSSM scenarios and a common reference for setting experimental limits on susy particles. The allowed space is the narrow green band which looks like another line from a distance. Indeed, after seeing this one you will never put mSUGRA in your mouth again. The situation is slightly better in the general, unconstrained MSSM. But not much better. It is tough to reduce the fine-tuning below one part in ten. This is bad enough to justify serious theoretical and experimental studies of various extensions of the MSSM. There are several directions one can pursue to reduce the fine-tuning. All have one thing in common. Since, by definition, the MSSM is minimal, the other scenarios get complicated. David chose the direction that can be summarized by: the higgs was at LEP but we were dumb enough to have missed it. The fine-tuning problem in supersymmetric models is fueled mostly by the 115 GeV limit on the higgs boson mass. But this limit stands for a higgs with the standard-model-like interactions. If the higgs decays are modified then this limit might become less stringent. With the higgs mass of order the Z mass the electroweak fine-tuning problem can be avoided. With this in mind, David removes one of the MSSM assumptions: the R-parity conservation. R-parity was designed to prevent excessive proton decay, but if only some of the R-parity violating couplings are switched on we can get away with it. David adds the barion number violating UDD terms into to the MSSM superpotential. This opens a possibility of the higgs decaying into two neutralinos, each of which subsequently decays to 3 quarks (without R-parity, the lightest neutralino is no longer stable). A higgs decaying to six jets was not properly studied at LEP, and it could be as light as 80 GeV. In the presence of R-parity violation susy phenomenology is dramatically modified. There is no stable LSP (lightest supersymmetric particle), hence no missing energy signatures. The bulk of David's talk was devoted to strategies of discovering the higgs and susy particles in this weird scenario. The funny thing is that the main role would fall to LHCb (usually considered a poor relative of ATLAS and CMS), as its design may allow to see displaced vertices associated with the neutralino decays. Should we all believe in the R-parity violating MSSM then? Not necessarily. David's model is not perfectly natural itself, as hiding the higgs requires a non-generic choice of parameters. However, his talk made clear that our theoretical bias has badly influenced experimental searches for new physics (for example, non-standard higgs decays haven't been given enough attention). What's worse, the theoretical bias has promoted scenarios that nowadays seem implausible. After 30 years of physics beyond the standard model we realized we have no idea what should we expect at the LHC (unless it is just the standard model). So the clever thing to do now is to investigate as broad spectrum of new physics signals as possible. David's famous last words were: we should think what can we use a 14 TeV machine for, beyond killing the neighbour's dog. The transparencies are not available, as usual (and Carthage must be destroyed). The paper of David and company is here. Update: This post hit the charts because it contains the word puke. It's not me, it's David, i'm just reporting ;-) Pity, he didn't say anything with f..., i would certainly get even more hits.